Here's a blueprint for a successful social media marketing plan. When I went rock climbing for the first time, I had no idea what I was doing. My friends and I were complete newbies about ropes and rappelling and every other bit of jargon and technique that goes with climbing. We saw others doing it spectacularly well. We were thrilled at the thought of reaching the top of the climbing wall; we had no idea how to get there. I’d imagine that a social media marketing strategy could feel the same way. If you’re starting from square one, it might feel equal parts thrilling and overwhelming. You know what you want to do and why. You can see that others have climbed the social media mountain; you’ve got few ideas how to get there yourself. It’d help to have a plan. We’ve shared before about different parts of a social media strategy -- the data and research and personal experience behind what works on social media. Now we’re pleased to put it all into a cohesive, step-by-step blueprint that you can use to get started. If you need a social media marketing plan, start here. Starting at the ground floor and building up, here is our overview of how to create a social media marketing plan from scratch. I like to think of this plan like a road trip. Start out by pointing yourself in the right direction, then choose the way you’re going to get there, check in regularly to make sure you’re on track, and have some fun along the way. 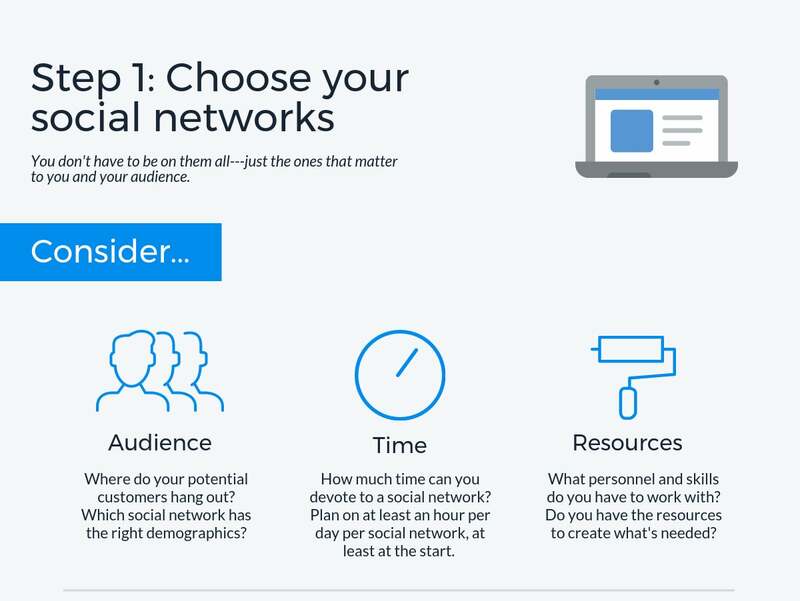 Step 1: Which social media sites you should use? Social media is as homogenous from network to network as soda pop is from brand to brand. Sure, it’s all social media, but Google+ and Twitter might as well be Mountain Dew and Pepsi. Each network is unique, with its own best practices, own style, and own audience. You should choose the social networks that best fit your strategy and the goals you want to achieve on social media. You don’t have to be on them all -- just the ones that matter to you and your audience. Some things to consider that can help you choose not only which social networks to try but also how many to try. Audience: Where do your potential customers hang out? Which social network has the right demographics? Resources: What personnel and skills do you have to work with? Social networks like Facebook emphasize quality content. Visual social networks like Pinterest and Instagram require images and videos. Do you have the resources to create what’s needed? For the first part of this decision, you can reference the audience research and demographics from surveys like those conducted by Pew Research. 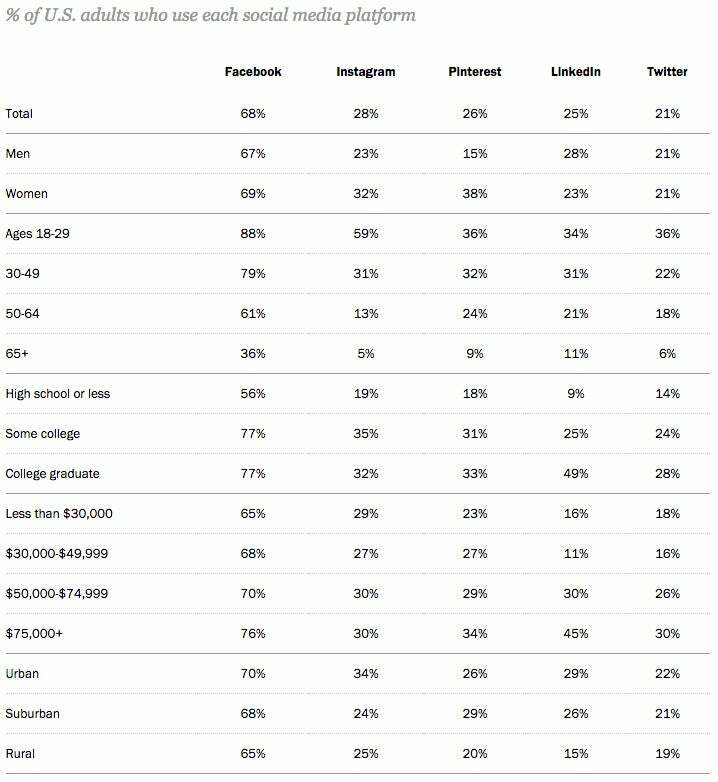 For instance, Pew has complete data, collected last year, of the demographics for Facebook, Instagram, Pinterest, LinkedIn and Pinterest. Here is a side-by-side comparison of the major social media platforms’ user demographics. For Snapchat’s user demographics, you can check out this “Who’s on Snapchat, anyway?” blog post by Snapchat. One of our monthly checks here at Buffer is to visit each of our social media profiles and make sure that our profile photos, cover photos, bio and profile info are up-to-date and complete. It’s a key part to our social media audit. A completed profile shows professionalism, cohesive branding and a signal to visitors that you’re serious about engaging. 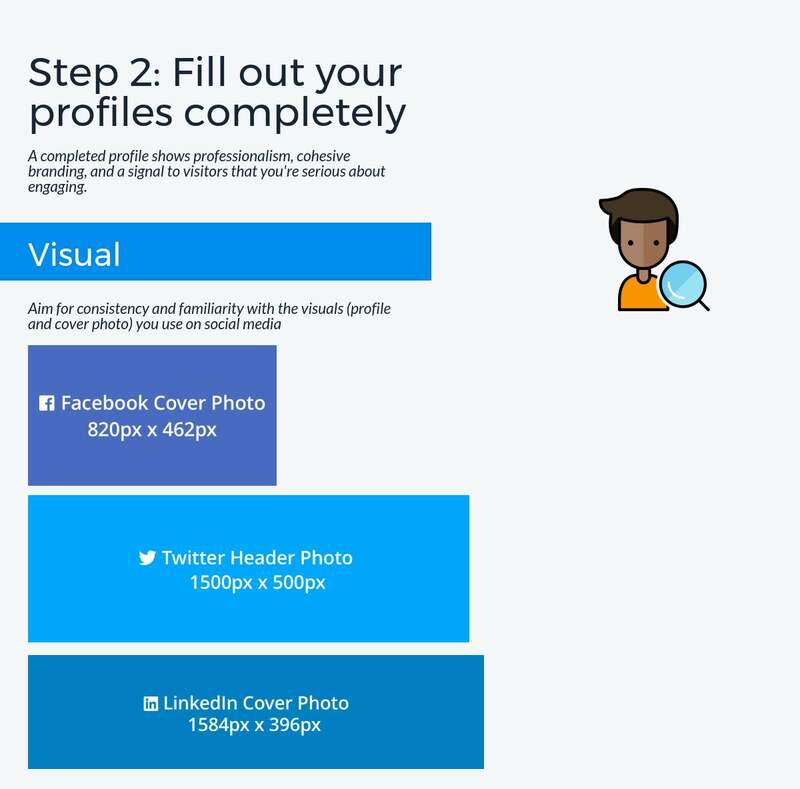 Profiles will require two parts: visuals and text. For visuals, we aim for consistency and familiarity with the visuals we use on social media. Our profile photo on Instagram matches our profile photo on Facebook. Our cover photo on Twitter is similar to our cover on LinkedIn. To create these images, you can consult a social media image size chart that will show you the exact breakdown of dimensions for each photo on each network. For an even easier time of it, you can use a tool like Crello or Canva, which comes with prebuilt templates that set the proper sizes for you. For text, your main area to customize is the bio/info section. Creating a professional social media bio can be broken down into six simple rules. The temptation at this point might be to jump right in and start sharing. Just one more step before you do. Your foray into social media will be more focused and more on point if you come up with a voice and tone for your content right off the bat. To do so, you could spend time coming up with marketing personas and debating the finer points of your mission statement and customer base. These are all well and good. But for a social media marketing plan just getting off the ground, you can make this process a bit easier. If your brand was a person, what kind of personality would it have? Describe in adjectives what your company’s personality is not. Are there any companies that have a similar personality to yours? Why are they similar? 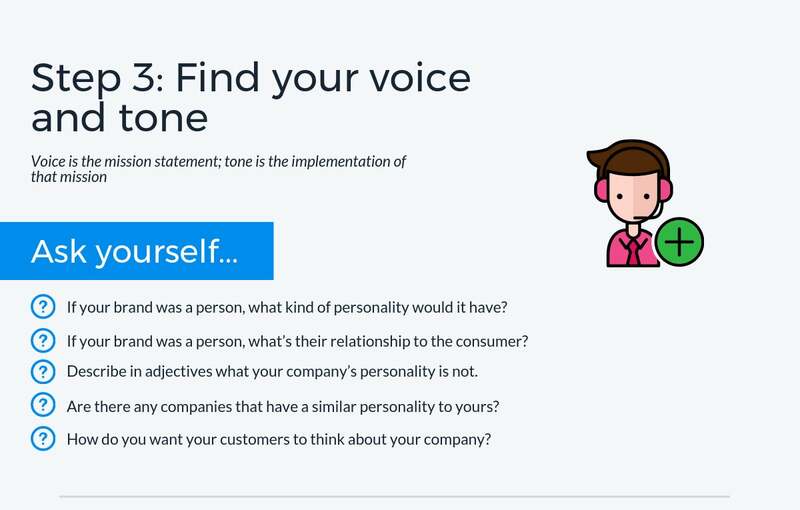 How do you want your customers to think about your company? Voice is the mission statement; tone is the implementation of that mission. Cultivate a voice that delights your customers, then your customers will be thrilled to spread the love about you. It depends. So much of the social media experience is about your individual audience and niche. What works for you might not work for me, and you never know until you try (we’ll get to trying in step five). That being said, there is some pretty good data and insight about where to start. Here’s what we’ve found to be good jumping off points. What should you be posting? Videos are ideal for engagement. The push toward video content has plenty of anecdotal evidence -- as you browse your Facebook News Feed and Twitter timeline, you’re likely to see videos all over. 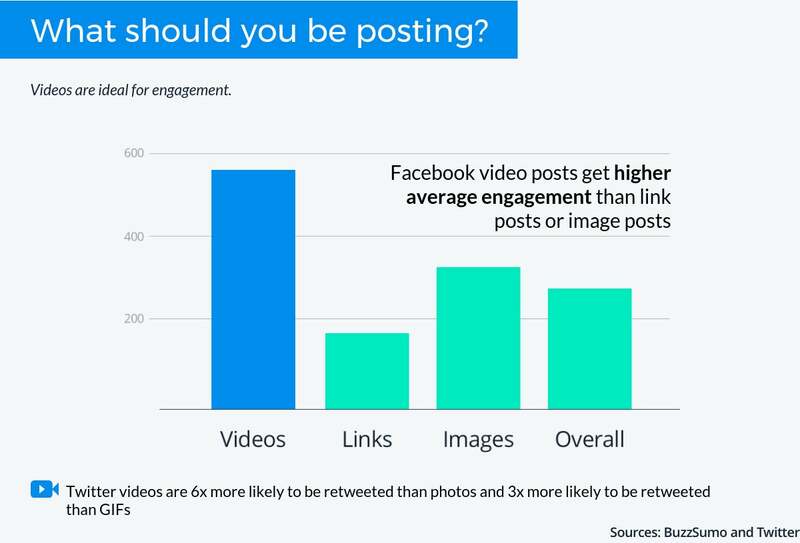 There’s data to back up this trend: Videos posts get more views, shares and Likes than any other type of post. And it’s not even close. On Facebook, video posts get higher average engagement than link posts or image posts, according to BuzzSumo who analyzed 68 million Facebook posts. On Twitter, videos are six times more likely to be retweeted than photos and three times more likely to be retweeted than GIFs, according to Twitter. If you want to get started on creating social videos, here’s our video marketing guide on creating epic content on Facebook, Twitter and more. This way your followers know what to expect from you, and you can hone your sharing to a specific type, making it easier to perfect and to experiment. How often should you be posting? There’s been a lot of interesting data out there about how often to post to social media. Some of the factors that might impact your specific sharing frequency may include your industry, your reach, your resources and the quality of your updates. 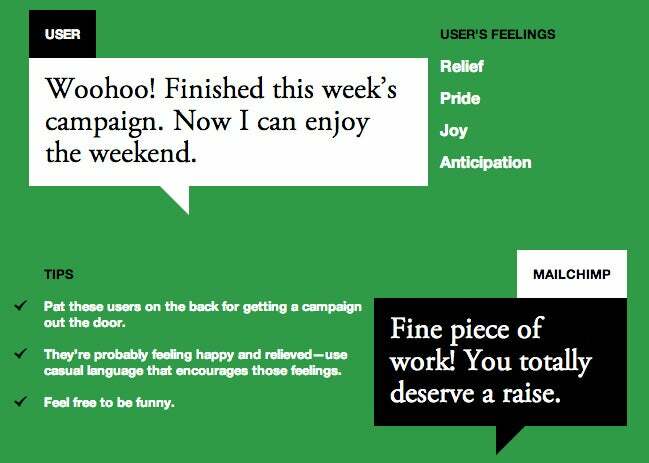 The social network you’re using will have its own best practices, too. If people love your updates, you can typically always get away with posting more. For a specific number, here’re some guidelines we’ve put together based on some really helpful research into how often to post to social media. When should you be posting? There are many neat tools to show you the best time of day to post to Facebook, Twitter and more. These tools look at your followers and your history of posts to see when your audience is online and when historically have been your best times to share. So what’s someone to do who’s just starting out on these social networks, with no audience and no history? Again, this is where best practices come in. 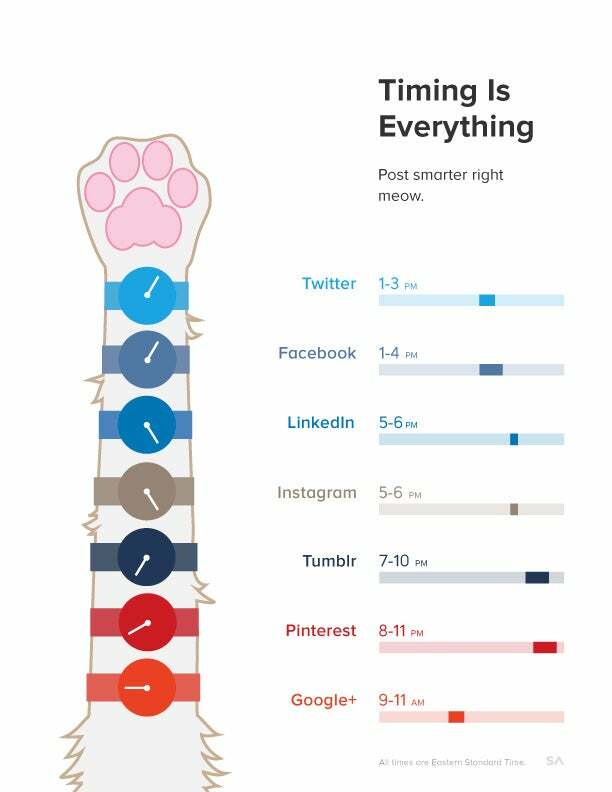 Perhaps the most helpful (and adorable) infographic I’ve seen about timing comes from SumAll, which compiled timing research from sites like Visual.ly, Search Engine Watch and Social Media Today to create its awesome visual. Here’s an overview of what they found in terms of timing (all times are Eastern Time). Instagram: 5 to 6 p.m. weekdays and 8pm on Mondays with a sweet spot at 6 p.m. I would recommend experimenting with these times (in your local time) and a few randomly-picked times as you’re starting out. Once you have been posting a while, you can use your own data and tools like Facebook Insights, Instagram Insights and Followerwonk to find your brand’s best time to post and refine your posting strategy. Remember how we talked about social media sharing being a very individual, specific endeavor? Your stats will likely start to bear this out. The more you post, the more you’ll discover which content, timing, and frequency is right for you. How will you know? It’s best to get a social media analytics tool. Most major social networks will have basic analytics built into the site; it’s just a little easier to seek and find this information from an all-encompassing dashboard. These tools (I’ll use Buffer’s analytics as an example) can show you a breakdown of how each post performed in the important areas of views, clicks, shares, Likes and comments. Which social media stats are best? We’ve gained some insight from looking at each of these main statistics and the composite engagement statistic on a per-post basis. 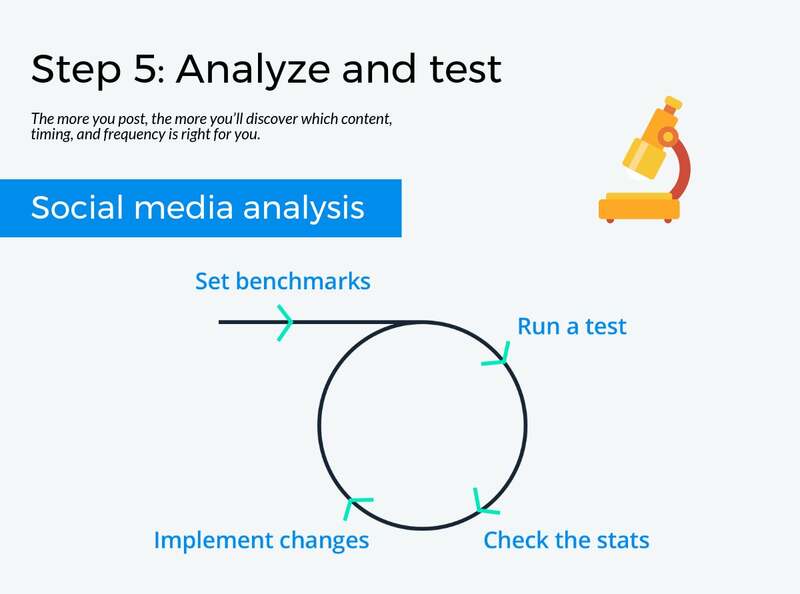 The resulting stat gives us a great look, over time, of how our social media content tends to perform and we can then test and iterate from there. Here’s one way to analyze your performance. Set a benchmark. After two weeks or a month of sharing, you can go back through your stats and find the average number of clicks, shares, Likes and comments per post. This’ll be your benchmark going forward. You can come back and update this number at any time as your following and influence grow. Test something new. We’re open to testing just about anything at Buffer. We’re in the midst of some tests right now on our Facebook account. Do Facebook Live videos get more views than non-live videos? Does the video length matter? We’ll often hear about someone’s new strategy or get a new idea and then test right away. Did it work? Check the stats from your test versus the stats of your benchmark. If your test performed well, then you can implement the changes into your regular strategy. And once your test is over, test something new! The final piece of a social media marketing plan involves having a system you can follow to help you stay on top of updates and engage with your community. To start with, automate posting of your social media content. Tools like Buffer allow you to create all the content that you want to, all at once, and then place everything into a queue to be sent out according to whatever schedule you choose. Automation is the secret weapon for consistently excellent sharing, day after day. Your plan doesn’t end with automation, though. Social media requires engagement, too. When people talk to you, talk back. Set aside time during your day to follow up with conversations that are happening on social media. These are conversations with potential customers, references, friends and colleagues. They’re too important to ignore. One way to stay up on all the conversations that are happening around you and your company is to create a system for listening and engaging. Tools like Buffer Reply and Mention will collect all social media mentions and comments on your posts in a single place, where you can quickly reply your followers. What would you share with someone new to social media? Coming up with a social media marketing plan is a great step toward diving in to social. If social media looks thrilling and overwhelming all at once, start with a plan. Once you see the blueprint in front of you, it’s a little easier to see what lies ahead. Want to Build Your Brand on Social Media? Here Are Some Quick Tips.